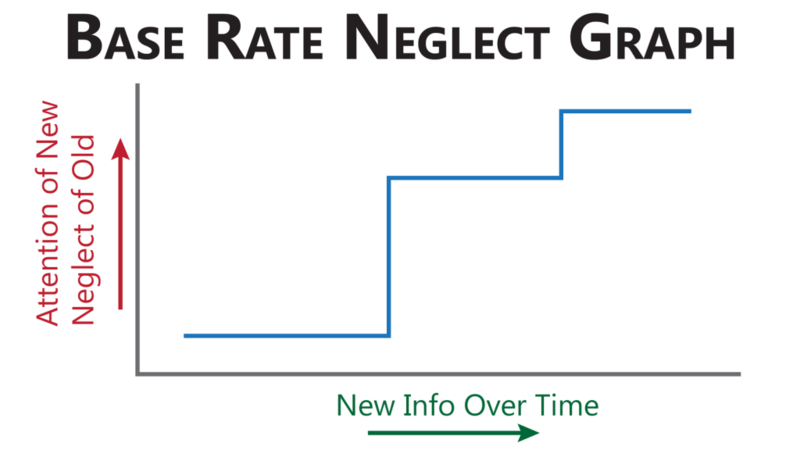 Base rate neglect is the tendency to ignore base general information, in favor of specific (new, novel, attention grabbing) information. The base rate neglect is also known as the base rate fallacy. This bias ties into the previous biases I have covered. Please see the bottom of the post for previous biases. If something is generally understood, novel new information comes along and sways someone to accept it without integrating it into the previous understanding. The availability heuristic of the new information presented, affects our attentional bias, and we then focus on that new information as an anchoring effect to blind us from paying attention to what we previously knew and understood. The old previous information is boring compared to the new titillating information that grasps our attention. The better way to deal with new information, is to integrate it into the old information. The previous general conclusion, understanding or model, needs to be updated with the new information. The old should not be neglected, ignored, denied, disregarded, dismissed, etc. We need to appreciate and remember the old information. We have memories of past knowledge. We have to avoid getting sucked in by the wonder, amazement and awe of how novel new information affects us. This issue is especially evident in probabilistic and statistical decision making. Our ability to intuitively determine probabilities is error-prone. To better understand how probabilities actually function, learning about Bayes’ theorem is required. Otherwise, we tend to favor the immediate, anchored, focus of attention on the most available information. Think of someone investing or playing the stock market. New information impacts us in the moment, and is the most available “in the now”. It hits us harder, more vividly. It will affect our current decision making, as it is the most current information. We have fear of missing out on an opportunity that pressures us into focusing on the immediacy of the “new”, and that has us also focus on the information in the now more than previous information. Not taking the time to recall previous information, and integrate it in a non-contradictory manner, can and often does result in bad decisions. The opposite of the base rate neglect, is the conservatism bias. In that case, the base rate is overly weighted, instead of neglected. New information is weighed less and tends to be ignored. That will be covered when I get to the “C” category of biases.